TODAY IS THE LAST DAY TO ENTER! Submission deadline is tonight at 6pm EST. ATTENTION CREATIVE GREEN PARENTS! IF YOU MADE SOME AWESOME DIY COSTUMES THIS YEAR FOR HALLOWEEN – ENTER THEM INTO OUR HALLOWEEN COSTUME CONTEST! Halloween has come and gone but the photos linger on! 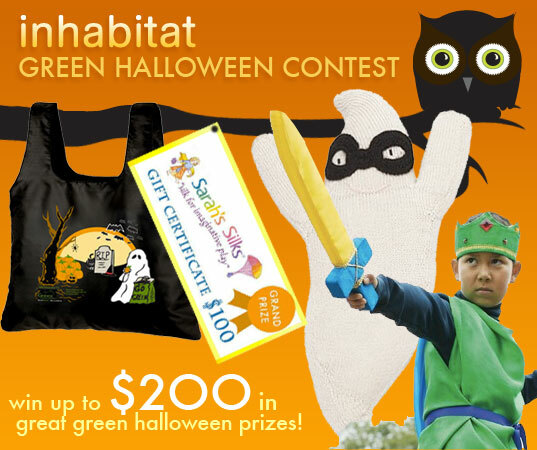 If you dressed your kiddos up impressive homemade, upcycled or repurposed eco-friendly Halloween costume and happened to take pics – now is your LAST CHANCE to enter them into the Inhabitots Green Halloween™ Costume Contest! This year we are awarding over $300 in fabulous prizes to the costumes that we find the most clever, cute and captivating — and we are awarding two grand prizes, a runner-up prize and honorable mentions to costumes selected by both our judges, and by YOU, Inhabitots readers! Click though our gallery to view last year’s contest winners and get inspired! And read on to learn all about this year’s fabulous prizes! The little cutie in the costume voted most popular by Inhabitots readers will win a $100 gift certificate to Sarah’s Silks. 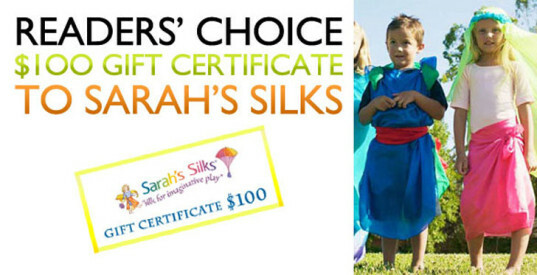 We love Sarah’s Silks high quality playsilks, toys and dress-up costumes for boys and girls of all ages. Sarah’s Silks promote imaginative play, and the versatile playsilks possibilities are truly endless during playtime. Read our review of Sarah’s Silks to get an idea of all that’s in store for this lucky prize winner. The winner of this year’s Editors’ Choice award for best Green Halloween™ costume will be awarded a $100 gift certificate to Oeuf! Oeuf offers a gorgeous collection of eco-friendly clothing, goodies, furniture and layette for green babies and kids. Kids are sure to find something they love in Oeuf’s Halloween line-up of festive 100% baby alpaca knits. Or perhaps something from Oeuf’s recently launched delightful and quirky fall 2013 collection. 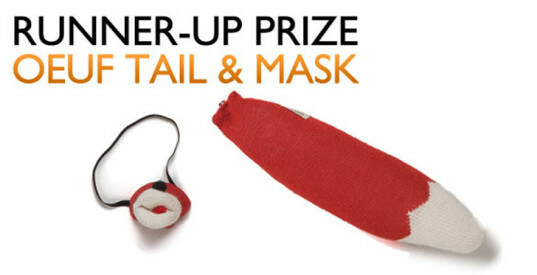 The Oeuf love continues as this year’s runner-up for best costume will be awarded a Oeuf fox mask and tail set to continue the dress-up fun year-round! Valued at $56, this beautifully made set is sure to inspire plenty of make believe fun! 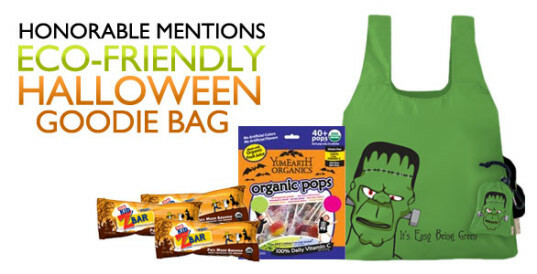 This year’s runners-up will receive a spooky reusable Halloween ChicoBag filled with delicious treats: YumEarth Organics lollipops and CLIF Kid‘s new Halloween-inspired Monster Chocolate Mint ZBars! The little cutie in the costume voted most popular by Inhabitots readers will win a $100 gift certificate to Sarah's Silks. 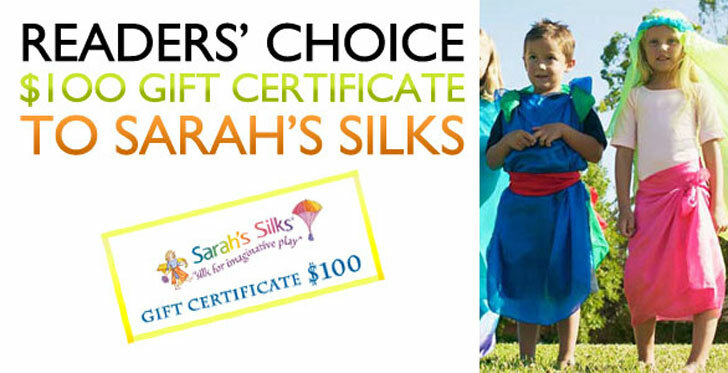 We love Sarah's Silks high quality playsilks, toys and dress-up costumes for boys and girls of all ages. Sarah's Silks promote imaginative play, and the versatile playsilks possibilities are truly endless during playtime. Read our review of Sarah's Silks to get an idea of all that's in store for this lucky prize winner. 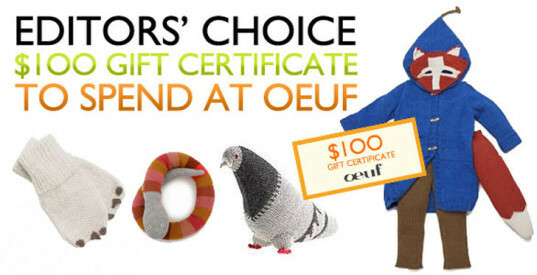 The winner of this year's Editors' Choice award for best Green Halloween™ costume will be awarded a $100 gift certificate to Oeuf! Oeuf offers a gorgeous collection of eco-friendly clothing, goodies, furniture and layette for green babies and kids. Kids are sure to find something they love in Oeuf's Halloween line-up of festive 100% baby alpaca knits. Or perhaps something from Oeuf's recently launched delightful and quirky fall 2013 collection. The Oeuf love continues as this year's runner-up for best costume will be awarded a Oeuf fox mask and tail set to continue the dress-up fun year-round! Valued at $56, this beautifully made set is sure to inspire plenty of make believe fun!